• National Evangelical Association board member insists on "God's agenda"
MINNEAPOLIS, Minnesota (CNN) -- A sharp difference of opinion over which issues ought to top the political agenda of Christian conservatives spilled out into the open at this week's meeting of the National Association of Evangelicals. The group rebuffed complaints from some of the religious right's leading lights about the organization's newfound focus on global warming. "We have observed that Cizik and others are using the global warming controversy to shift the emphasis away from the great moral issues of our time, notably the sanctity of human life, the integrity of marriage and the teaching of sexual abstinence and morality to our children," said the letter, which was signed by prominent religious conservatives such as James Dobson, Don Wildmon, Paul Weyrich and Gary Bauer. Cizik has been outspoken on the global warming issue, saying in a recent documentary that "to harm this world by environmental degradation is an offense against God." But Dobson and the other signatories of the letter to the National Association of Evangelicals board said evidence supporting global warming was not conclusive and that the organization "lacks the expertise to settle the controversy." "The issue should be addressed scientifically and not theologically," they said, calling on the group's board to either rein in Cizik or encourage him to resign. One of the men who signed the letter, Tony Perkins of the Family Research Council, said global warming was part of a leftist agenda that threatened evangelical unity. "We're not going to allow third parties to divide evangelicals, and I think that is what is happening in part with the global warming issue," Perkins said. However, the association board not only stood behind Cizik, but also further broadened the group's agenda with a statement condemning torture, which charged that in pursuing the war on terror, the United States had crossed "boundaries of what is legally and morally permissible." But one of the board members, the Rev. Paul de Vries, said, "It ought to be God's agenda, not the Republican Party's agenda, that drives us. "We're actually tired of being represented by people with a very narrow focus," he said. "We want to have a focus as big as God's focus." 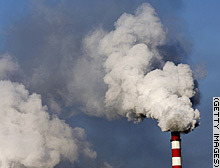 Scientists say pollution such as this contributes to global warming. Evangelicals are arguing about making the fight against global warming a priority. Should the National Association of Evangelicals restrain its policy director from giving his views on global warming?